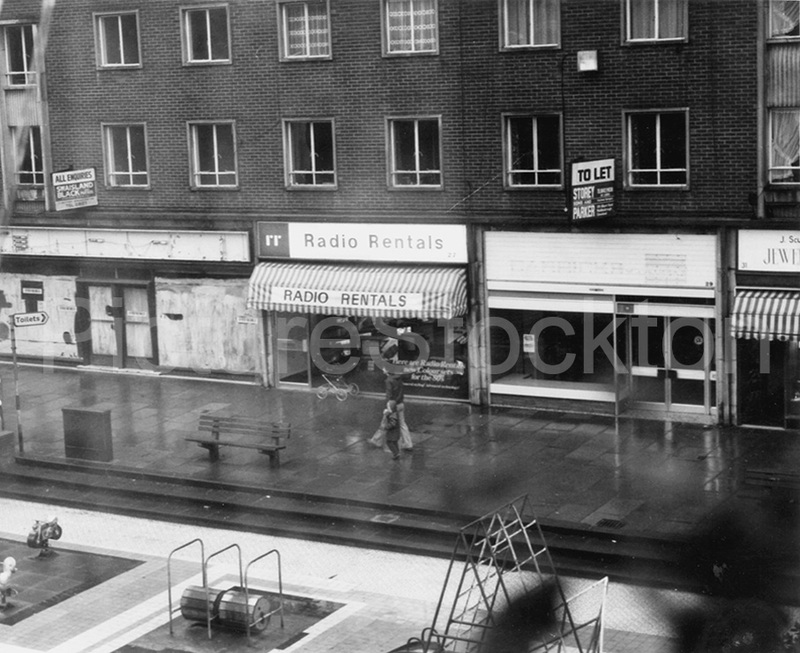 This picture shows Billingham Town Centre at its absolute worst, it was taken from the window of my Grandmothers flat in 1980. From the mid 1950s and through the 1960s Billingham was a prosperous colourful and interesting “New” town, Billingham has very little history as a town, apart from St. Cuthberts Church there is very little of Billingham built before 1900. Haverton Hill was the main part of the Billingham Urban District Council when it was formed in 1923 and the main emphasis was centered there as shown by the Council Offices in Nelson Street, when the council was formed the major part of Billingham was centered around the Green and along Station Road towards Wolviston. The arrival of “The Synthetic” or ICI as it later became known increased the population enormously and Billingham grew at a terrific rate, this growth was maintained until the creation of Teesside Council in 1968, from that point Billingham, Stockton and Thornaby started a downward spiral, Nortons delightful High Street thankfully escaped this. When this picture was taken the aviaries and fishponds had gone and the bandstand was just so much street clutter, street entertainment was no more, many of the original shops had disappeared forever, Timothy Whites, Home & Colonial, Meadow Dairies, Chain Libraries, some of these were taken over by other companies others just faded away as shopping habits changed, this is true of many towns and Billingham is not exceptional in this respect, the bowling alley had arrived and disappeared as it did in many other towns. It is hard to believe that in the early days of Billingham Town Centre people would travel from places such as Sedgefield and Bishop Auckland to visit it. Change is inevitable and should be welcomed but it doesn’t always bring improvements, still it is always saddening when the place where you grew up, went to school and forged long lasting friendships changes so drastically. Billingham is my home town and even though I haven’t lived there for over 40 years I will always remain a “Billingham Lad”. In 1967 the year before Billingham became part of Teesside I was a 16 year old pupil at Bede School on the Billingham Campus. One day we were spoken to by a group of visiting councillors who sought to assure us that nothing would change and that Billingham would continue to thrive in the new set up. I’m proud to say that none of my fellow cynical 16 years olds swallowed this guff for a moment and of course we were right as our town declined in front of our eyes. Good photo, but very sad to see its decline. Very nostalgic to hear news of Billingham. I lived on West Avenue from 1939 till we emigrated to Canada in 1954 so I never knew the Town center that was built there. However I have the happiest memories of my life living in this town. I went to the Church of England Infants school with Miss Liverseed as the head mistress then the School on the Green and the South Modern. I remember fishing in Billingham Beck, spending lots of time at the old station spotting trains and going to the pictures at the Picture House. I went to Yarm to fish in the River Tees and climbed and walked in the Cleveland Hills. Going to Seaton Carew and Redcar it was wonderful. I just happened across your comment about Billingham town centre and noticed that you mentioned living in West Avenue. We have recently moved in to number 20. It has had many alterations in recent years and was hoping to find some old pictures on the Internet that show what it was like back in the earlier days. If you have any I would be very interested. Our tri to the towny as we called it started with a walk from Low Grange across the ‘Cammy fields’ through the estate between the Telstar and John Whiteheads Park, though the park past years Garden for the blind? Shops regularly visited were, Boyes, The do it your self shop toy department, a look in Bill Beaties sport shop window (you weren’t allowed in unless you were buying) the pet shop, Finley’s too lol at the old men head sculptures, the art gallery we usually were asked to leave that, Halfords to have a look at the bikes, never had much to spend but we had a great time, especially running like crazy down the ramp!! Lovely town to grow up in as a kid. Totally agree. My family moved from Haverton to Billingham in 1953. A wonderful place to grow up. As a child I was unaware that the town centre, or the Square as we called it, was part of a new town. John Whithead Park was brilliant. The Woods, possible titled as the stadium site. Walks to Wolviston, Billingham Beck, Cowpen Bewley. Cycling to Seaton Carew or Wynyard bank for the daredevils. I was in Billingham last week and you are right. It feels as if the life has been sucked out of it. Very few people in the centre or on the streets. I was delighted that the tradition of chatting to random people still exists. I walked down to Oxygen corner which now No longer contains the mysterious effluent pools which caused so much excitement on the bus ride back from the Boro. Thanks for the pics. Excellent site. I will be sailing up your east coast later this year, I will be fairly close to Lunenberg and Mahone Bay, do you want me to pop across to Oak Island and dig a couple of holes on your behalf?. Dig Deep Bruce, Dig Deep ! They are down to about 300 feet and still nothing. As a Norton lad (who left 40 years ago) glad to hear it is still doing well. Sad to hear about the decline of Billingham. It was a place to go for leisure shopping as a teenager and the modern town centre was fun, and in the fresh air what’s more unlike modern malls. Billingham Forum also great – ice skating, swimming, theatre – is that still there? Love your older pics of Billingham, any others that you have put on here? Type Coleman into the search box and you will find all my postings. They are a varied lot but I have just received a couple of more uplifting shots of Billingham in the 1960s, I will send them to Picture Stockton in the next couple of weeks. Also I have a slideshow of about 90 Billingham pictures from the 1890s to the 1960s, contact me at billinghamlad@gmail.com if you want a copy. Sad picture indeed! Billingham’s real history was as an Anglo-Saxon village and only the bit round the green survived even when we moved to Cumberland Crescent in 1949. The longer you live the more nostalgic you get – or is it just me? No Patricia, not just you. I was from Cumberland Cres also. I lived there at 27 with my family before getting married. My wife and I just got back from South Africa. Visited Peter Pallister who also lived in Cumberland Cres. On our way back to Canada we had two weeks in the U.K with a week on Teesside. We go back every couple of years for a reunion with old school pals.